Not only did Brad Childress (sort of) call out his quarterback for his poor decision-making, he complained ad nauseum about the officiating. Childress also criticized the Loadholt penalty during his KFAN interview. 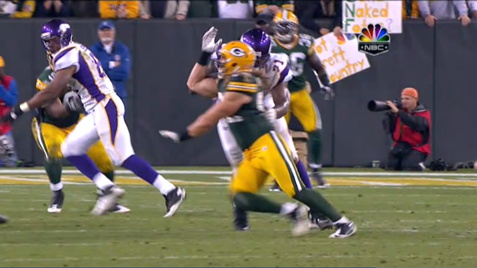 Childress has a right to complain about the non-holding call, but the facemask was obvious. Obvious. Besides, during the game, Twitter was atwitter with complaints about Childress’s playcalling in the second half, so maybe he should look in the mirror before slamming his quarterback or the officials in the media. 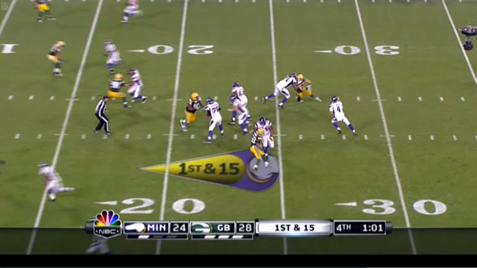 I remember at one point late in the game Favre ran what looked to be a planned rollout. Who in the hell calls a planned rollout by a senior citizen QB on a hobbled ankle? Oh, I know this one — Brad Childress! Is that right? 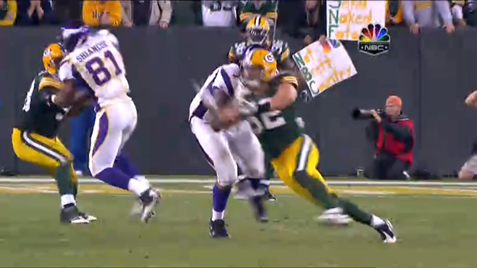 Favre must have been like “WTF?” when he got that play call from the sideline. looking at video (as opposed to stills) of the hold call, it looked to me like loadholt was grabbing clay’s hair, not the facemask. 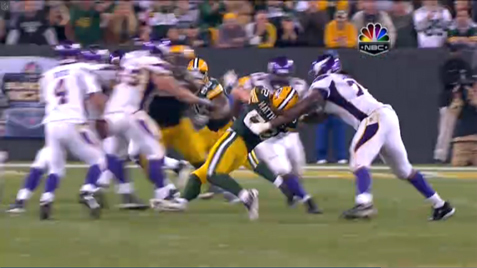 i know that pulling hair is OK on tackles, but does it result in a holding penalty in blocking situations? In the 6th picture, it’s pretty clear that Loadholt’s hand was up in Matthews facemask…no? Do you have to get two feet down before a catch is considered a completion? If that is the case: Jennings recieved a most favorable spot. Around an extra yard.